Tom is a member of the firm’s Litigation and Workers’ Compensation Practice groups. His practice includes civil litigation, insurance defense and workers’ compensation litigation. 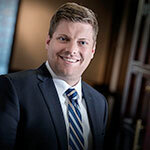 Tom received his Juris Doctor from the University Of Nebraska College of Law in 2014 where he graduated with distinction. Tom received his undergraduate degree from the University of Nebraska Lincoln, with a major in finance and a minor in economics. Tom also spent a summer studying economics at the University of Oxford, England. Although, Tom grew up in Colorado, he has strong ties to Nebraska and has always been a lifelong Husker fan. Tom enjoys Husker games, golfing, and spending time with friends and family. Juris Doctor, University of Nebraska College of Law, with distinction, 2014. Bachelor of Business Administration, University of Nebraska Lincoln, 2011.